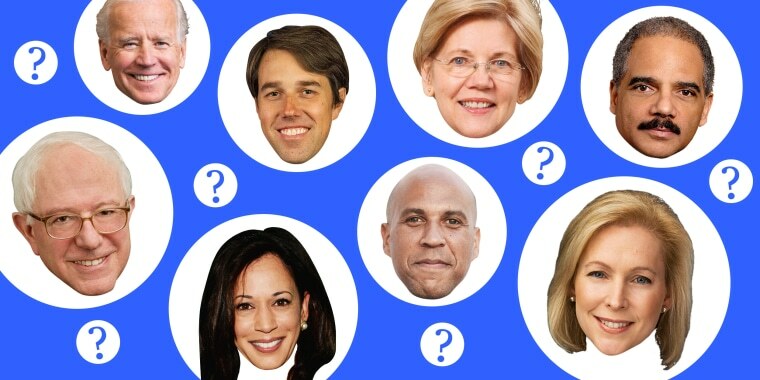 The race for the 2020 Democratic nomination is on. Who's in, who's out and who's a maybe. Here’s a timeline of the ever-expanding field. For months, dozens of potential challengers to President Donald Trump have been “taking a look at,” “thinking about” and “not ruling out” a White House bid. Right now, the field is crowded with potential would-be candidates who haven’t said one way or another whether they’ll actually run. Some, however, have formally declared their candidacies while others have launched exploratory committees. It's expected as many as 20 contenders could ultimately dive in, making for a crowded race. Here’s a timeline of the ever-expanding field, with slash marks denoting rumored candidates who took themselves out of the running. Follow our 2020 election news here.